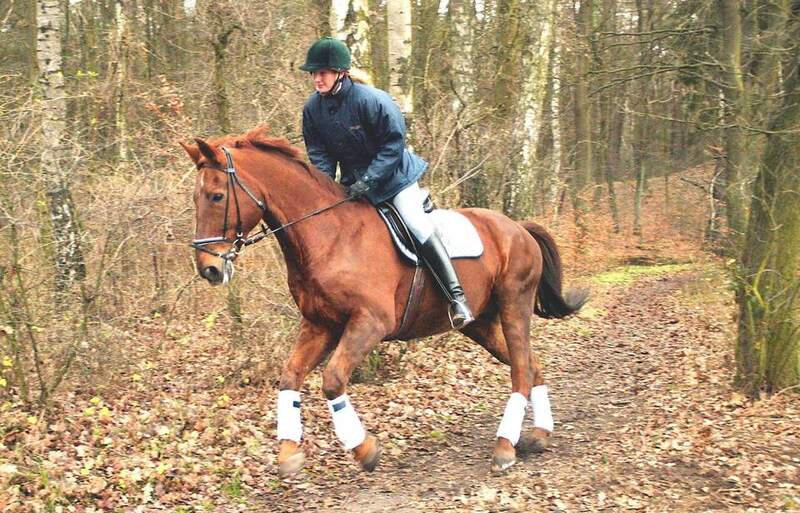 Learn to gallop and canter/lope safely in any situation. Learning to ride involves learning to control your horse at all three gaits: walk, trot and canter or lope. After you feel comfortable trotting the next step is cantering or loping. As your skills progress you'll learn how to rate your horse for collection, extension, and eventually feel confident enough for a "hand gallop." To begin, start working with your horse on the lunge line with the reins tied out of the way. Your coach will be in control. That way you can concentrate on your seat, without affecting the horse's or pony's head. Once you feel secure on the lunge line, you can try on your own. Your helmet and safety stirrups or safe boots. A helper that can competently lunge a horse. Begin with your horse or pony calmly trotting. Slide your outside leg behind the girth and apply pressure with both legs (or heels if the horse is reluctant). Your inside leg stays on the girth. This encourages your horse to begin the canter with the hindquarters and correct lead, and bend around your inside leg. You will feel your horse lift its shoulders, and drive with its hindquarters. Keep slight pressure on the inside leg to maintain the horse’s forward motion. If the reins are in your hands, shorten your reins slightly to maintain gentle but steady contact as the horse lifts its head. Allow your hands to follow the motion of the horse’s head and neck always keeping gentle contact with the reins, as the horse strides into the canter or lope. Western riders will not ride with contact but follow the motion without pulling on the reins. Sit deep in the saddle, keeping your hips loose and following the rocking motion of the horse. Keep your shoulders back and sit upright. Don’t allow your upper body to sway. Check that your horse is on the correct lead. As you become more experienced you’ll be able to feel the motion of the lead foreleg pulling your hip slightly forward. But in the beginning, it will be easier to use your peripheral vision to check the shoulder and foreleg. Tipping your head down to look will pull you out of correct position. To correct the lead, sit deeply into the saddle, apply slight leg pressure, closing down on the horse and resist the forward motion of the horse’s head. Continue to squeeze back on the reins until the horse is again trotting. Ask the horse again to canter, starting at step one. To go from a canter back to a trot, follow step 7, but instead of cueing for the canter soften your hand and leg aids and begin to post. Always practice cantering (and all other gaits) going in both directions of the ring or arena. You’ll probably find one side more difficult and so may your horse. Increase the likelihood of starting on the correct lead by cueing for the canter as you are trotting into a corner. Keep your back and hips flexible. Don’t stiffen up. Learn to identify the correct lead by feel by riding your horse while it is being lunged.